This month’s WTA winner asked for holiday themed ATCs “including Madonna (not the singer)”–that made me laugh and I decided to see if I could make a non-musical Madonna ATC. It is hard to see on the scan but the edges have been foiled with a gold and greenish patina, and I went nuts on the rhinestones. Just trying to make it look “old.” What do you think? This ATC is stunning! I love the rhinestones (can you ever have too much bling?) and the foiled edges. You did a beautiful job with this theme. It turned out beautiful Alice! 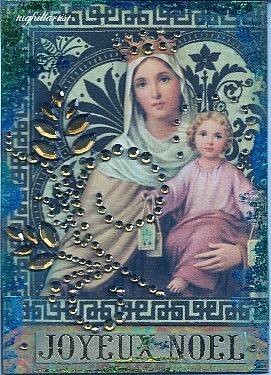 This ATC is an absolute stunner Alice! Very elegant. I tried to click to see larger but came up same size.